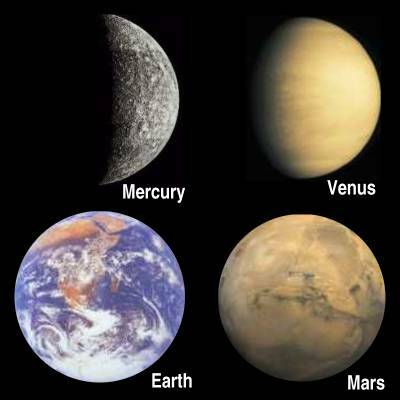 Venus and the Earth are members of the group which is called "the terrestrial planets" and they were born in the same rotating cloud of gas and dust 4.6 billion years ago. Their surfaces show a varied terrain: mountains, plains, high plateaus, canyons, volcanoes, ridges and impact craters. Both have hemispheres which differ remarkably: on the Earth there is a land and a water hemisphere, on Venus a northern mountainous region with uncratered upland plateaus and a southern part with relatively flat rolling terrain, which appears to consist of vast lava plains. Both worlds have continents and lowland plains. Both planets have atmospheres with dense clouds. Until the era of space exploration with its missions to Venus in the early 1960s, the last noted point was a strong argument that under its dense clouds Venus might be very Earth-like and might even have life. Some people thought the surface of Venus might be covered with large jungles similar to those which existed on the Earth during the Carboniferous and Permian periods with prehistoric reptiles and insects - a very common and popular idea in science novels and films. Later, scientists believed that the surface of Venus was covered with oceans or a hot desert without a trace of moisture. Today we know after years of intensive study of the numerous data transmitted by space probes that Venus is radically different from the Earth in many important ways. It is not a twin sister or even an ordinary sister of our planet - it is only a cousin. 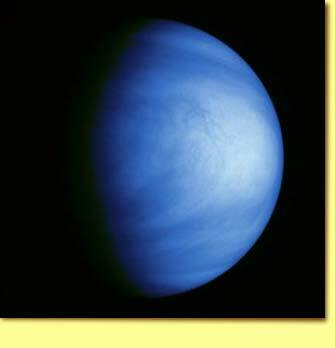 The pressure of Venus' atmosphere at the surface is 90 atmospheres (about the same as the pressure at a depth of 1 km under the Earth's oceans). The dense gaseous shell is composed mostly of carbon dioxide. There are several layers of cloud many kilometres thick composed of sulphuric acid, in contrast to Earth's water vapour clouds. The Venusian clouds completely obscure our view of the surface; on the other hand, the clouds in the Earth's atmosphere cover only 70 percent. The dense atmosphere of Venus produces a runaway greenhouse effect that raises its surface temperature by about 400 degrees to over 740K (hot enough to melt lead). Venus' surface is actually hotter than Mercury's despite being nearly twice as far from the Sun. There are strong (350 kph) winds at the cloud-tops but the winds at the surface are very weak, no more than a few kilometres per hour. Venus probably once had large amounts of water like the Earth but it all boiled away. It is now quite dry. 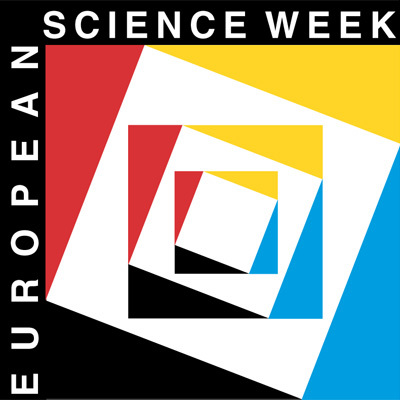 The origin of the oceans played an important role in the evolution of our planet. But the Earth would have suffered the same fate had it been just a little closer to the Sun. The surface of Venus is a glowing hot stony desert. But like the Earth, it contains continents, plains, canyons, mountains, impact craters (actually 160 have been discovered on Earth) and volcanoes. The volcanoes on Venus often develop complexes amid fracture zones. 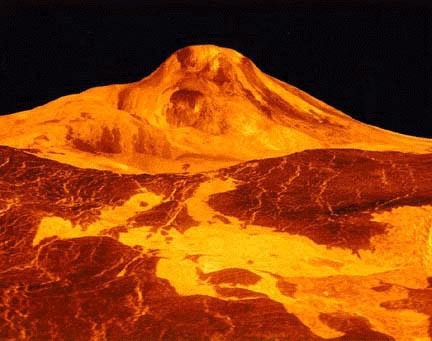 The volcanoes on Venus have gentle slopes and are called shield volcanoes. Instead of exhibiting a sharply raised cone, shield volcanoes are relatively flat, like an armoured shield. They form when lava erupts from the sides rather than from the summit. There is no evidence of massive tectonic movement although local deformations can exist. Almost all volcanism on Venus seems to involve fluid lava flows without any explosive eruptions. Due to the high atmospheric pressure, Venusian lavas would need much higher gas content than Earth's lavas to erupt explosively. The main gas driving lava explosions on the Earth is water which does not exist on Venus. On Earth, plate tectonics sustains the large difference between ocean basins and continental masses. The lack of such overall differences on Venus suggests an absence of planet-wide crustal plates. Tectonic activity on Venus seems localised to zones spread around the planet, especially near highland regions. Overall, Venus displays a quite young surface, no more than a few hundred million years. (That's about twice the average age of the Earth's surface features.) 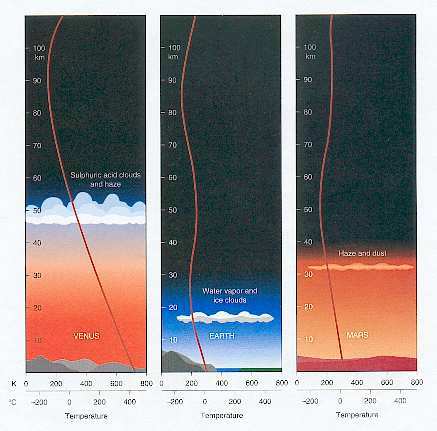 The degree of volcanism seems more widespread than on the Earth. The entire surface may have been reshaped over the past several hundred million years by lava flows. Rift valleys, which form where crustal plates are separating, show extensive surface fractures. Also visible are folded and faulted regions that resemble some mountain building regions on Earth. Such features indicate local tectonic activity. The high degree of current activity that seems to typify Venus should continue for eons to come. And where are the crustal plates? Perhaps Venus is a "one-plate planet", with a crust that never became rigid. Like dough, Venus' crust is not stiff enough to slide around in pieces. Instead, it wrinkles and puckers locally from heat and lava upflow.